Heavy snow across the UK is currently causing delays to mail in many areas. Customers should expect mail deliveries to take longer during the adverse weather conditions. Rural areas are particularly affected. 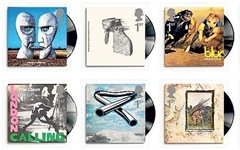 Royal Mail have recently launched a new series of stamps featuring famous album covers. The stamps should start appearing on mail within the next week and feature 10 different album covers. These include Pink Floyd's The Division Bell, Coldplay's A Rush of Blood to the Head, Primal Scream's Screamadelica, Blur's Parklife, New Order's Power, Corruption and Lies, the Stones' Let It Bleed, Mike Oldfield's Tubular Bells, Led Zeppelin's fourth (untitled) album, and Bowie's Ziggy Stardust and the Spiders From Mars.